Been a while since I’ve updated here….need to quit slacking! 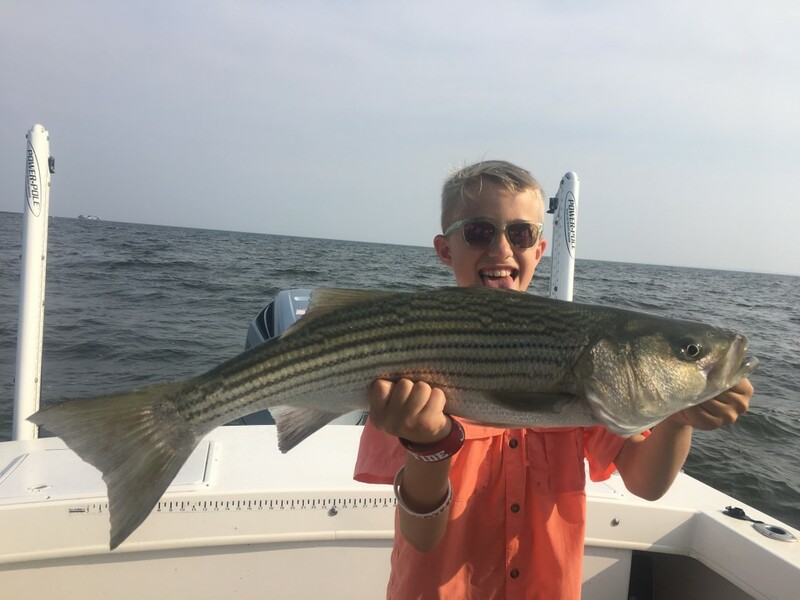 young angler with a 30″er! Good stuff! I worked the waters from above the bay bridge to Sharpes Island while slipping the boat in South River. Had a great couple of months up there but am glad to be back to Beacon Marina at Solomons. 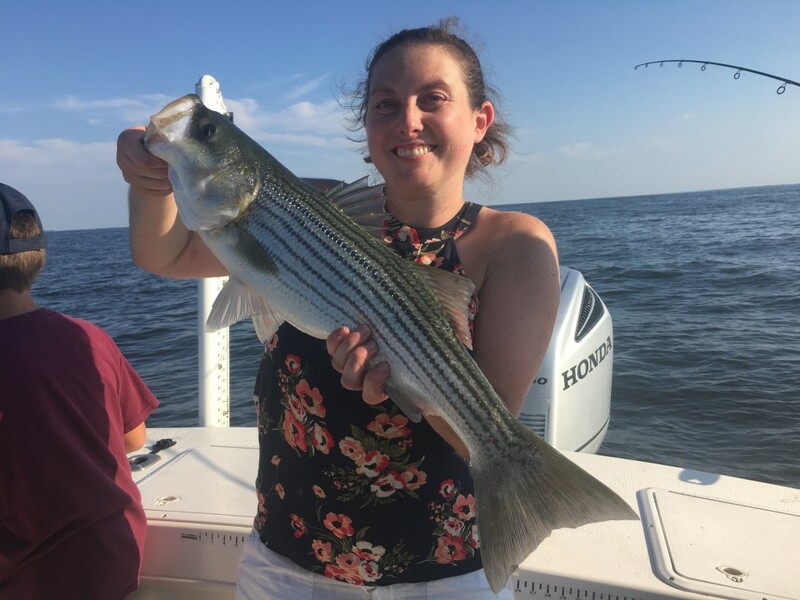 Masses of Stripers and Blues have certainly entered the waters north of Solomons and the catching is great! Most days I’m finding nice fish on structure along with huge numbers of Stripers and Blues in the main stem of the bay. Also I’ll be going to the eastern shore islands from Solomons hunting down specks. Cobia, Reds and Blues to the south could be interesting when the conditions are good! All in all it’s been a great summer and I’m thrilled to be back at solomons. Hated the hour commute before and after trips out of south river. Anchor Yacht basin was a great place to slip my boat…..clean, organized and they really keep track of all activities……good stuff for sure! Short Notice Walk-On fishing trip this Thursday, 10 August and more dates……14, 15 and 16 August walk on trip dates. I’ve moved the boat to Beacon Marina out of Solomons. Thursday’s weather looks perfect! We will be running early to shallow structure surface plugging then rolling open bay finding breaking Stripers, blues, possible Spanish mackerel and even a shot at a giant red. Also eastern shore island speck fishing could happen. I provide licensing, all baits and tackle and fillet fish at the end of the day. You can bring your own gear if you want. Medium sized tackle recommended. Bring what you want to eat and drink. Trips will be comfortable in my judge 27′ Chesapeake. This boat allows us go anywhere we need!